Location, location, location! 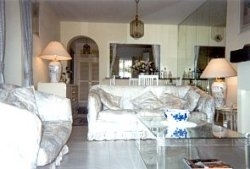 Only 10 minutes stroll from this superb south facing apartment to the delightful beach at Puerto banus and 2 minutes from the 5 star Andalusia plaza hotel with its magnificent casino. You cannot be better located whether for summer vacation or winter break. 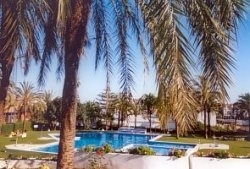 The Andalusia garden club is probably one of the most prestigious addresses in Puerto banus. The accommodation is everything you would expect from a complex of this quality. Award winning gardens and magnificent pool area with lots of private sun bathing areas plus shade when necessary. It also has private tennis courts. 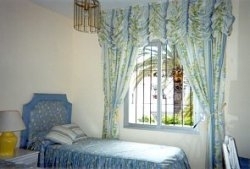 The accommodation benefits from high quality furnishings plus SKY TV with many English Channels/Sport Channels. The balcony directly overlooks the amazing pool area. There are several upmarket restaurants within a 5 minute walk but should need a taxi the rank is outside the complex. The famous Puerto banus marina packed with yachts of the rich and famous is a ten-minute walk away. You will not be disappointed. This complex has 24 hour security with electronic gates and is managed by the residents many of whom live on the complex for long periods - it is meticulously maintained. The Reception Office is open daily (except Sundays) from 10.00am to 2.00pm and personnel there will be only too happy to deal with any queries. Otherwise the guard on duty at the complex will be happy to help. For the more sportier among you, there are several golf clubs in Puerto Banus, including La Quinta (27 holes), Los Naranjos (18) and Aloha (18). Why not visit the 1998 Ryder Cup Course of Valderrama nearby. Do NOT forget the Saturday Market (2 mins walk) from 10.00am to 2pm -it is not just 'any old market' it is a social event with a great atmosphere - visit the YANZ (mexican) restaurant- very reasonably priced - and have lunch to help you wind down after you have done your shopping. It is advisable to go early. Puerto Banus is located just 35/40 minutes south of Malaga Airport and 10 minutes from Marbella by car. It is a pleasant and scenic journey down from the airport via the main coast road of the Costa del Sol (N340) or more quickly along the new E15 motorway. 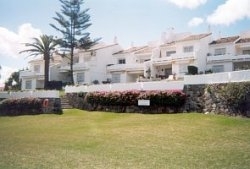 The location is perfect for families, golfers and those who want to be close to all amenities, yet in a very quiet and peaceful complex - enjoying quality accommodation. Children just love the area with every sporting activity imaginable - the big kids don't miss out either - from horse racing to Scuba Diving - from just lazing in the sun to dancing the night away - whatever your taste you will find it at Puerto Banus. Shopping at the Port is an experience with many of the shops one would normally expect to find only in cities such as Madrid - Gucci, Armani, La Perla, Prada, Mango and of course El Corte Ingles (a Spanish equivalent of Harrods) plus many more. Check in time is 3pm and check out is 3pm on day of departure. It is advisable to ensure your own belongings. 50% Deposit required 6 weeks before departure date. Deposit Euro 300 refundable upon checking apartment.